OEM airbox with mount and a few extra parts. parts are sold as is. S ervice to you. We remove, inspect and if possible test parts before we list them. Then we take clear pictures of the actual item, from many angles. Pulled from a vehicle with 66k original miles. This is an OEM intake box for 1984-1986 Nissan 300ZX. 1985 300ZX. Mileage: 66,745 (original miles). Engine: VG30 (E) 2960. Normal wear to be expected as this is a used item. 300ZX 1996. Make / ModelNISSAN 300ZX. 300ZX 1990 -1996. No labor warranty is provided. This is a air filter assembly with mass air flow sensor removed from a 90 Nissan 300zx non turbo. a pretty image. 300ZX 90-91. Part/Notes: DRIVER AIR INTAKE TUBE. For clarity, passenger side refers to right side when sitting in vehicle, and driver side refers to left side when sitting in vehicle. -Life is life and issues arise; people make mistakes. 1989 Nissan 300ZX 2 2, Base 3.0L V6 - Gas 1988 Nissan 300ZX 2 2, Base 3.0L V6 - Gas 1987 Nissan 300ZX 2 2, Base 3.0L V6 - Gas 1986 Nissan 300ZX 2 2, Base 3.0L V6 - Gas 1985 Nissan 300ZX 2 2, Base 3.0L V6 - Gas 1984 Nissan 300ZX 2 2, Base, Turbo 3.0L V6 - Gas. 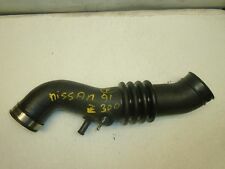 Off a 1986 Nissan 300zx 2 seater with manual transmission. Your item will arrive promptly. We will do our best to make sure you are satisfied. Part Number: N/A See Pictures For Condition & Compatibility. 1984-1989 Nissan 300ZX Models OEM Air Filter Box Assembly In Overall Good Condition As Shown. The Air Filter Is Not Included. Was removed from a 1986 Nissan 300ZX. INFINITI J30 1993. Make / ModelINFINITI INFINITI J30. INFINITI J30 1993 -1995. No labor warranty is provided. 1996-1998 Nissan 240SX. 2003-2009 Nissan 350Z. 2004-2011 Nissan Murano. 1997-2002 Nissan Quest. 2004-2009 Nissan Quest. 4 Pieces of T6061 Billet Aluminum Wheel Spacer. ONLY FOR 66.20 MM CENTER BORE,Make Sure OPEN SLOTS OR CAVITIES ON YOUR WHEEL. 300ZX 90-96. No labor warranty is provided. - The second level quality part. It is of average miles and normal condition for its age. - The highest quality part. It is of low miles and/or exceptional condition for its age. 300ZX 90-96. No labor warranty is provided. - The third level quality part. - The second level quality part. It is of average miles and normal condition for its age. - The highest quality part. It is of low miles and/or exceptional condition for its age. Condition: AIR CLEANER LEFT AIR INTAKE DUCT WITH RESONATOR TUBE. This Part may also fit in these cars. Ships Out Fast. 60 Day Returns. Dependable Dealer. 1996-1998 Nissan 240SX. 2003-2009 Nissan 350Z. 2004-2011 Nissan Murano. 2002-2011 Nissan Altima. 1997-2002 Nissan Quest. 2004-2009 Nissan Quest. 1 Pair of T6061 Billet Aluminum Wheel Spacer. ONLY FOR 66.20 MM CENTER BORE,Make Sure OPEN SLOTS OR CAVITIES ON YOUR WHEEL. Condition: AIR CLEANER RIGHT AIR INTAKE DUCT WITH RESONATOR TUBE. OEM Part Number: 1657630P02 1658530P15. This Part may also fit in these cars. Product Style: AEM Intake Bypass Valve. Includes ONLY The Bypass Valve. Air Bypass Valve for Cold Air Intakes. Installs along upper portion of AEM intake systems with minor modifications. AEM 20-400S Product Specifications. FREE US Shipping! 30 Day Money Back 90 Day Warranty! 1996-1998 Nissan 240SX. 2003-2009 Nissan 350Z. 2004-2011 Nissan Murano. 1997-2002 Nissan Quest. 2004-2009 Nissan Quest. 1 Pair of T6061 Billet Aluminum Wheel Spacer. ONLY FOR 66.20 MM CENTER BORE,Make Sure OPEN SLOTS OR CAVITIES ON YOUR WHEEL. 1996-1998 Nissan 240SX. 2003-2009 Nissan 350Z. 2004-2011 Nissan Murano. 1997-2002 Nissan Quest. 2004-2009 Nissan Quest. ONLY 1 piece of T6061 Billet Aluminum Wheel Spacer. ONLY FOR 66.20 MM CENTER BORE,Make Sure OPEN SLOTS OR CAVITIES ON YOUR WHEEL. 1996-1998 Nissan 240SX. 2003-2009 Nissan 350Z. 2004-2011 Nissan Murano. 1997-2002 Nissan Quest. 2004-2009 Nissan Quest. ONLY 1 piece of T6061 Billet Aluminum Wheel Spacer. Wheel Bolt Pattern 5x114.3mm (4.5"). 300ZX 87 thru 12/86. 300ZX 84 from 11/83. 300ZX 85-86. - The second level quality part. It is of average miles and normal condition for its age. - The highest quality part. It is of low miles and/or exceptional condition for its age. 300ZX 90-91. No labor warranty is provided. 2 THROTTLE BODY AIR CLEAR DUCTS LEF. - The second level quality part. It is of average miles and normal condition for its age. - The highest quality part. / goes before air box. for both side. / for none turbo models only. This item was dis-assemble off an 90 300zx none turbo 3.0 L VG30DE V6 2 Seaters Pearl White/Brown. Condition: AIR CLEANER RIGHT DUCT. OEM Part Number This Part may also fit in these cars. 300ZX 92-96. Bronze BRZ Maroon MRN White WHT. Blue BLU Green GRN Teal TEA. Black BLK Gray GRY Tan TAN. Beige BEI Gold GLD Silver SIL. Amber AMB Burgundy BRG Red RED. Part Color Definitions. S Surplus Used part for which too many are available. Free Shipping! Free Returns! 101 Day Warranty!